The SoundBot SB571 Bluetooth Wireless Speaker is unique in that it is a Bluetooth wireless speaker that can also function as a wired speaker, ideal for those who have varying needs at varying times. The SoundBot SB571 features two 6W speakers for a total 12W system—quite robust for a portable wireless speaker. Each speaker features premium 40mm drivers and a passive subwoofer for comprehensive sound quality with impressive highs, bold mids, and a deep, respectable bass. A large speaker cavity further accentuates sound quality by providing a superior architecture for soundwaves to work with. The SoundBot features both wireless Bluetooth 3.0 connectivity as well as a built-in 3.5mm aux port. Most wireless speakers are simply wireless, but with the built-in aux port, you get wired connectivity as well, kicking up this speaker’s versatility. Because the SB571 has both a 3.5mm aux port as well as Bluetooth 3.0 capabilities, and therefore can be used both wired and wirelessly depending on your needs, it’s inherently universally compatible, being ready for every device that is compatible with Bluetooth 3.0 or a 3.5mm aux connection. The SoundBot boasts 10 hours of music playback when used wirelessly via a Bluetooth connection. When wired, that playback time jumps to 12 hours, for an all-night listening session. Despite the long playtime, recharging is relatively short, being readily accomplished in roughly 3 hours, give or take depending on whether you used the device wired or wirelessly. All the controls you need for listening to music and making conference calls are located conveniently on top of the speaker itself. Controlling the SoundBot with your synced device, such as your Apple Watch or smartphone, is also super easy and offers great control. The SoundBot SB571 has a neat geometric design on the front which, despite creating visual interest, doesn’t become obtrusive or annoying—it strikes a right balance. As far as a function is concerned, I was surprised that it can be used both wirelessly and wired. Most wireless Bluetooth speakers I’ve had in the past have only had the wireless function, but by adding the built in 3.5mm aux port, SoundBot has not only up compatibility, but usability as well in that, sometimes you’re just not near your smartphone. (Shocker, I know.) Or maybe you have other reasons for wanting to go old school—the extra two hours of battery life on the SoundBot is definitely one reason to consider using the wired function when the occasion calls for it. All of that said, the Bluetooth 3.0 connectivity works spot-on. There’s no lag and pairing is easy. It works great with both my iPhone and Apple Watch, and I like that I can control it and view how much battery I have left that way as well. Essentially, the paired devices are your remote control, which is kind of cool, because you’re more likely to keep up with them than an additional remote control anyway. The size and weight of the SoundBot SB571 Bluetooth Wireless Speaker is very comparable to its competitors; like them, it’s ultraportable. As I already mentioned, its standout feature is easily the ability to be used wired or wirelessly, which many of its competitors lack. But that doesn’t mean that it doesn’t have other great qualities as well. The sound is so much better than I expected. The manufacturer mentions a larger speaker cavity in its write-up and it makes sense that this would improve the sound. After all, small spaces are not known for being acoustically friendly. By creating a larger space, you naturally improve sound quality, and I think it’s very apparent in the sound the SoundBot puts out—basically, you do notice the difference in a very good way. The passive subwoofer helps a lot with the bass performance; that, and the larger sound cavity, might explain the richer bass this thing has compared to a lot of the competition, so fans of a solid bass might want to take notice. As I mentioned earlier in this write up, the battery life is 12 hours for a wired connection and 10 hours for a wireless connection—both are impressive. But, as we all know, sometimes a long playback time comes with a long recharge time—but that so isn’t the case with the SoundBot SB571. In fact, the average recharge time is only 3 hours, which is a huge pro in my book, because with the technology we have today, there’s no excuse for a super-long recharge time. This is both an indoor and outdoor speaker. If you’re like me, you already have your own high-quality speaker setup indoors, so you’re not really looking for a portable speaker to be used as your main go-to speaker. That said, it’s great for taking camping or listening to by the pool; quite honestly, the sound quality is good enough to make it an excellent choice for a kid’s room. The SoundBot SB571 Bluetooth Wireless Speaker is covered by a 1-year warranty on parts and labor. 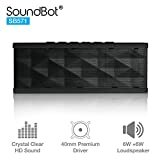 The SoundBot SB571’s ability to be used as both a wireless and wired speaker, combined with its long battery life and good sound quality, make it a standout in my book. This speaker uses Bluetooth 3.0 instead of the newer, faster Bluetooth 4.0. That said, the difference isn’t huge, and it doesn’t really affect how the speaker pairs with today’s devices in a significant way.